We all have to die somehow. As an Oncology Nurse, I’ve seen more death than I care to. And while, as Christians, we don’t ultimately fear “crossing over to the other side”, I must admit, sometimes I do fear the process of dying itself. Whether from illness or accident, death can hurt. I’m not a fan of hurting. Worse than that are the violent deaths, like drowning or burning, or being murdered. Worse still, is being tortured and then killed. Yes, a morbid subject, and yet it’s been the path of many believers on their way to Heaven. This story in Daniel intrigued me from the first time I heard it as a child. 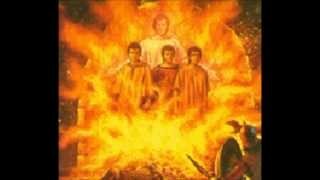 The three men; Shadrach, Meshach, and Abednego, Daniel’s friends, were living in exile in Babylon, in a pagan dictatorship, run by a megalomaniac. Nebuchadnezzar builds an image (probably of himself) 90 feet tall. Kind of like the Nazi salute; if your arm didn’t snap up when they said, “Heil Hitler”, you were suspect. Or flying the rainbow flag these days. First of all, what other group gets such a privilege? They used to ask if they could put it on the flagpole. Now they put it up and dare you to take it down. Sounds like bullying to me. Like most believers or other influential people from history, the people we remember most are those who did the hard things. They swam upstream. They were the minority, think of Martin Luther for example. He said he felt as if all men were born blind and he alone was condemned to see. Here in the book of Daniel we see that Daniel kneels to pray when everyone else is standing, and Shadrach, Meshach and Abednego stand when everyone else is kneeling. That’s counter cultural! Christianity itself is counter-cultural. Believers have never been the majority. Think of the 70 family members of Jacob’s family heading down to Egypt, or the eight people in Noah’s family. That’s a minority! Their accusation begins with praise for the king, a reminder of the law he just made, including the consequences, and then finger pointing at “certain Jews” who were in prominent positions in Nebuchadnezzar’s government. So certain Chaldeans pointed the finger at certain Jews. Were they hoping to get their positions once they were out of the way? It wouldn’t be the first time such a thing has happened. They say, we don’t need another opportunity. The response will be the same. They are confident that God is ABLE to deliver them from both the fire and the king, BUT IF NOT, they would not cave, even to save their lives. I’ve seen a vanity licence plate that said, BUTIFNOT, which automatically put this story in my mind. Also, during the bloody battle of Dieppe during WWII, in which many British and Canadian soldiers were killed, they were sent a message, asking how they were doing. Their response? “But if not…” It was understood by those receiving it, that they would stand their ground, even if it meant they could lose their lives. What was going through their minds as they were bound up and thrown into the blazing hot furnace? I can only imagine. Yet here we see that God does two things: He miraculously preserves their lives, and He is there in the midst of their ‘fiery trial’ with them. Usually it’s one or the other. Who is this fourth man? And what was there about Him, I wonder that made Him stand out? Even in the midst of the fire, was He even more glorious? Nebuchadnezzar, a pagan King, seemed to recognize Him. He is our Saviour and Comforter. Whatever we suffer, He suffers with us. And He is able to deliver. Our God is Mighty to save. He will likewise be with us through our journey to the other side, no matter what we may suffer. I wonder how the Jews can read this and not get that this Messiah they’re waiting for is also called the Son of God in the Old Testament. Now Nebuchadnezzar comes near and talks to these men. “Shadrach, Meshach, and Abednego, servants of the Most High God, come out and come here.” He doesn’t know God’s name, but he does recognize His power, calling Him the Most High God. Then the officials come near to see for themselves, and they are amazed that “the fire had no power; the hair of their head was not singed, nor were their garments affected, and the smell of fire was not on them.” (vs 27) The very definition of unscathed. This answered Nebuchadnezzar’s question of who was able to deliver them from his hands. Then he goes farther, and forbids anyone (any people, nation, or language) from serving or worshipping any god but their God. This would have been a huge change in their culture. The reason was because this God, who sent His Angel, and delivered His servants who trusted in Him, has frustrated the king’s word, by yielding their bodies. He was impressed with them and their God. His decree included severe penalties for speaking against this God because “there is no other God who can deliver like this.” (vs 28,29) This does not mean that He was converted, as we see later on in the book of Daniel, but just that He recognized the power of this God and thought He deserved the respect of not being maligned. He then promotes the men. So these Chaldean men who thought they’d soon get new jobs by getting rid of the competition, were probably fearing for more than just their careers. The tide has turned against Christian believers in the West very rapidly in the past few years. For all their talk of tolerance, they’re not very tolerant of us. For all their talk of diversity, they don’t appreciate that we are part of that diversity. For all their anti-bullying talk, they bully us. I can foresee several watershed issues on the horizon for the church. What’s a watershed issue? It’s like the peak of a mountain. When it rains the water flows down either side. Whether it’s gay marriage or gender issues, or women in Pastoral roles, we will need to take a stand. And whichever way we choose, there will be consequences. Our good old days are nearing the end. We may soon join the rest of the world where Christians have been suffering and paying for their faith with their lives. I recently read a fictional series called The Seven Trilogy, set in Canada in the near future. It was written by Sara Davison. In it Bibles were outlawed as hate literature. Not as far-fetched as you’d think. It’s terrifyingly plausible. It made me want to hide a few Bibles just in case. Questions- Do you find that you conform in a difficult situation, rather than stand your ground, in order to avoid punishment? It’s been said that unless you have something worth dying for, you have nothing to live for. Do you feel prepared for death? What do you fear about death, if anything? Response- Research Voice of the Martyrs. Read some of the accounts of persecuted believers. Pray for them. Consider sending a monetary gift or purchasing one of their books.